The New Faculty Majority is filled with dedicated, intelligent and passionate individuals committed to effecting lasting change within higher education. Some of them are the same dedicated, intelligent and passionate individuals who have been speaking out on behalf of faculty off the tenure-track for the past 20 years Adjunct Advocate/AdjunctNation.com have existed. In reading a piece about a recent national summit sponsored by the New Faculty Majority, I recognized the names of many of the 140 participants: Maria C. Maisto, president of the New Faculty Majority, Gary Rhoades, the former general secretary of the American Association of University Professors, Rich Moser, a senior staff representative for the Rutgers University council of AAUP and AFT chapters, and Joe Berry, a labor historian. Leaders of the New Faculty Majority presented a draft document laying out the goals and principles of a higher education-wide push to improve adjuncts’ working conditions. The document’s main goals are to secure better pay and benefits, job security, a role in college governance, and guarantees of academic freedom for faculty off the tenure-track. The New Faculty Majority document calls on colleges to launch efforts to improve adjuncts’ working conditions, and for the adjuncts to shapes the proposed changes. It’s a bold idea that has a fatal flaw. Colleges that promote sustainability and go green ultimately save money and can trade on their green cred when recruiting Gen Y students who may find such cred important. Colleges have no reason to commit to spending additional billions of dollars so adjunct faculty can be better paid and have benefits. Better still, there is an entrenched class of college administrators that has ballooned over the past decade, and who are costing hundreds of millions of dollars to state colleges and universities. This administrative bloat is one of the reasons college costs have risen so sharply, and it’s unlikely these administrators would sign on to see the funds used to pay them reallocated to pay non-tenured faculty. I hate writing this almost as much as I dreaded reading that the New Faculty Majority had produced a “draft document.” How many “draft documents” have been produced over the past two decades, all of which were intended to redress the exploitation of temporary labor in Academe? Remember the 1987 Wyoming Resolution passed at the CCCCs? It was about the teaching of writing, of course, but it included a frank discussion on the treatment of faculty off the tenure-track. In 1992, there was a somewhat sickening riff on the Wyoming Resolution with the Council of Writing Program Administrators’ (the people paid to exploit adjunct writing instructors) passage of the “Portland Resolution.” It was a document that set out guidelines for the employment of writing program administrators, full-time faculty who, it was suggested, needed “protection.” The Portland Resolution says absolutely nothing about the ethical treatment of one’s non-tenured writing instructors. In 1993, Judith Gappa and David Leslie (two tenured faculty) published The Invisible Faculty. It was the beginning of tenure-line faculty studies on how to improve the treatment and status of part-time faculty in higher education. That Gappa and Leslie had no help from a non-tenured faculty member in the writing of their book speaks volumes. 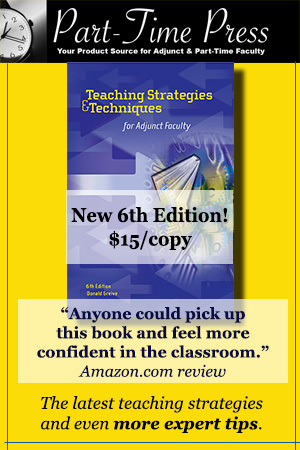 The book sets forth “best practices,” for the treatment of part-time faculty. Their research was based on surveys of over 900 part-time faculty, and the does offer a long list of suggested improvements. At the New Faculty Majority summit, the unions were well-represented, arguing that unionization has improved the lot of adjunct faculty. No, unionization has not improved the lot of the nation’s adjunct faculty, nor have the AFT, NEA or AAUP managed to stem the tide of colleges and universities hiring more and more part-time faculty. In 1993, when Gappa and Leslie published their book, there were 350,000 part-time faculty, and about 35 percent of the nation’s college faculty were off the tenure-track. Today, there are more than 1,000,000 faculty off the tenure-track—80 percent of the total college faculty employed in the United States. The numbers present damning evidence against a higher education union mafia that has collected dues from part-timers, while telling the gullible mainstream media that part-time faculty members need to be gotten rid of for the betterment of higher education. Jack Longmate was at the New Faculty Majority Summit. If you’ve been reading AdjunctNation, you’ll remember Jack as the part-time faculty union member who was forced out of his Washington State faculty union local leadership position after he spoke (as an individual) before legislators about ways in which his unified local was representing the interests of the full-time faculty over those of the part-time faculty. Longmate wrote to the president of the NEA and received a form letter in reply. It was a display of bullying that would have gotten most fourth graders suspended, but instead the NEA allowed its Washington State affiliate to bully a member for exercising his right to free speech. Joe Berry (see above) criticized me for saying this to a reporter from The Chronicle of Higher Education during interviews for a 2006 profile piece the newspaper did on me. The American Federation of Teachers followed suit in 2007, when I told the Michigan Messenger that, “Only 8 percent of the population have master’s degrees. It is hard for me to look at someone with a graduate degree in the job market and say you are at a disadvantage. You are not. It is a fallacy, a fantasy and an insult to the people who work at Wal-Mart stocking shelves with only a high school diploma. Those people don’t have options.” Craig Smith, the man who tried to suggest I was no “advocate” for adjunct faculty, earns $150,000 per year as an employee at the AFT, 10 times what the part-time faculty members of his own union earn per year, on average. Has anything changed? Yes. More people work in service industry jobs. Unemployment in some American communities is 30 percent, and now 11 percent of the population have master’s degrees. So what’s the answer to the exploitation of part-time faculty? 1. The only American national education union that will ever bargain aggressively on behalf of faculty off the tenure-track is one that doesn’t yet exist: a national union that only represents faculty off the tenure-track. 2. Non-tenured faculty themselves must limit their employment off the tenure-track within Academe to no more than 3 or 4 years. 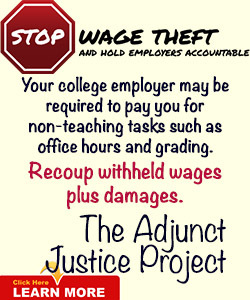 If no tenure-line job materializes, adjuncts must leave Academe for work elsewhere. If the majority of faculty off the tenure-track were there by choice, it would change the face of employment for those who might choose to teach part-time. 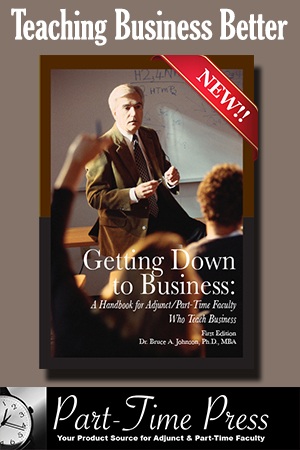 It’s the myth college administrators present to the public when discussing part-time faculty use; it needs to be a reality. 3. Non-tenured faculty must run for and take over the governing boards of their own professional associations and scholarly groups. Professional associations play a critical role in the lives of colleges and tenured faculty that could be leveraged to effect sweeping changes in the treatment of faculty off the tenure-track. I explain how in a 1996 op-ed piece published in The Chronicle of Higher Education. 4. Non-tenured scholars need to take over the national discussion of their own issues. While Michael Bérubé and other tenured and tenure-line faculty who have assumed the role of scholars and spokesmen for the nation’s non-tenured faculty are to be thanked, it’s time for them to be replaced by folks with actual skin in the game, such as Keith Hoeller and others who’ve yet to step forward. 5. Adjunct faculty, contingent faculty, non-tenured faculty, part-time faculty, whatever these individuals choose to call themselves, really makes no difference in how the general public perceive them. College faculty are “professors” to the general public.Use that perception to become experts whom the mainstream media turn to when asking questions about higher education. It’s time for some different perspectives. This is by means an exhaustive list. 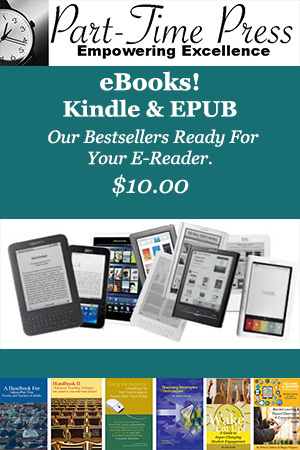 It’s a list that I’ve had since 1992, when I launched Adjunct Advocate magazine. The New Faculty Majority is made up of dedicated people who are spinning their wheels. The higher education media is made up of dedicated reporters who will to report on those wheels spinning. In another decade, I will retire. I am hoping that before I do I will witness some of these changes I’ve championed since 1992 take root. I’m hopeful, as always, and ready to lend a helping hand, as usual. Book Review: "How Economics Shapes Science"